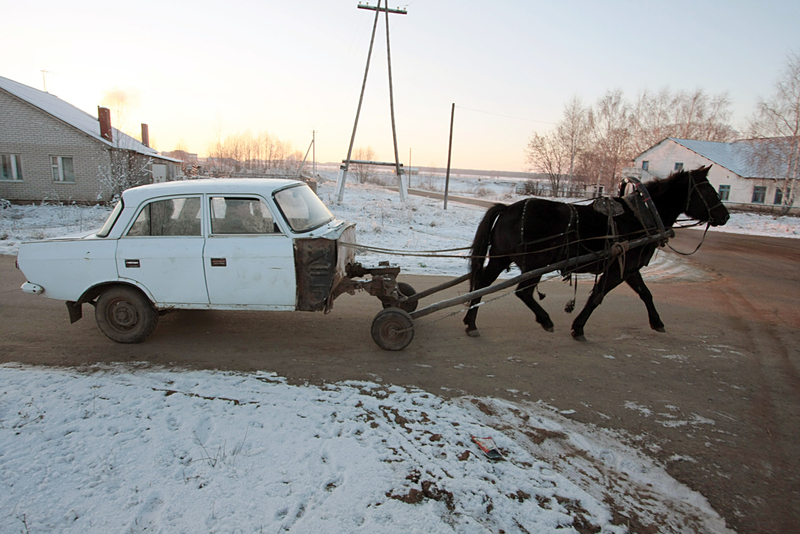 A resident of Tatarstan created a horsemobile. Every tenth Russian invents something for personal use. Making money is not their goal, and they are willing to share their know-how with others. Russians are passionate about their innovations for personal use, according to research by Konstantin Fursov and Thomas Turner at the Higher School of Economics. An estimated 10 percent of Russians have at least one invention, or have improved existing technologies. Among these are a bicycle that squeezes juice, and a horsemobile. After looking at international studies and interviewing 1,670 respondents from different Russian regions, Fursov and Turner concluded that user-innovation was much more popular in Russia than in other countries, and their share of innovations accounts for 9.6 percent of the Russian total; this figure is much lower elsewhere. User-innovation is defined as an invention created or modified not by the producers of goods and services, but by consumers themselves, based on their individual needs. The researchers have several hypotheses why Russians are so clever and innovative. First, the country's difficult economic conditions is a strong motivation. Outside of major urban areas, people are often poor, quality products are scarce, and the overall assortment is meager. "Sometimes it's easier to improve a device, than buy a new one," Fursov said. "This innovative culture evolved historically. Under the planned Soviet economy, when there was effectively no supply on the market, people turned to their own inventions to meet their basic needs. Also, under the Soviets inventive activity was supported. Research institutions and universities had clubs and organizations with a strong technology base, where people could bring ideas to life. And there were many popular science magazines." Today, scientific magazines and clubs have been replaced by the Internet. "Russia has a very high level of Internet penetration," Fursov said. "You can easily find the information you need on forums and various websites, as well as on social networks, and it has become possible to order cheap materials and devices online." Researchers identified two main groups of Russian innovators. The first group are primarily men who are educated and financially-secure. They invent for fun or career purposes, and primarily in the field of computer and information technologies. The second group is primarily composed of small town residents and villagers who become inventors out of material necessity. Their activity takes place in a variety of areas, such as work in the household, in home gardens and orchards, as well as with childcare and even transport. Russian inventors are rarely motivated by a desire to make money, the researchers said. Most are stimulated by personal interest and curiosity, as well as a wish to help others. This probably explains why Russian inventors are willing to share their ideas, but rarely patent their inventions. "Compared with other countries, we generate and disseminate more information, but less frequently try to commercialize our ideas," Fursov said.